Susie grew up by the seaside in Penarth, Wales, with a lisp and a really unfortunate choice of first name. 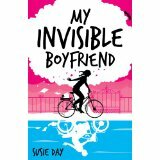 Susie now lives in Oxford in an international boarding school, sharing her home with 11 teenage boys. Her many careers have included guiding tourists, professional nappy-changing, teaching small people how many beans make five and taller people how to interrogate the beans from a post-structuralist perspective – but she always wanted to be a writer. Her first book, Whump! in which Bill falls 632 miles down a manhole, won the BBC Talent Children’s fiction prize. She writes for children and young adults, primarily about families, friendship and funny stuff (with occasional sad awkward wonky bits on the basis that life’s like that. She is the mastermind behind the awesome ‘We Have Crisps’ shop selling UKYA merchandise. Check it out here (warning: if you love books you will probably want to buy everything). Find her on Twitter @mssusieday and at http://susieday.com/. 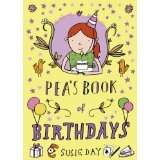 Pea’s Book of Birthdays: It’s Pea’s birthday, and all the family are gathered around to celebrate. But there’s one person missing – her dad. She has never known him, but is the story Mum always told her (the one about Dad being a pirate) really true? What is this mysterious Piratical Father doing now? So begins Pea’s quest to track down her dad once and for all. 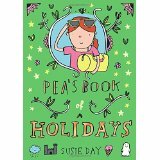 Pea’s Book of Holidays: Pea’s family are separating for the summer holidays. 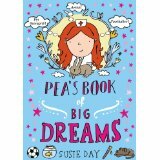 Big sister, Clover, is off to Drama Camp, Mum is staying at home to finish her new book, and Pea and Tinkerbell are going camping. 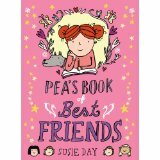 But things don’t go quite to plan, and Pea finds her summer suddenly filled with Enid Blyton, castles, ghosts and mysteries. The Secrets of Sam & Sam: Sam likes being a twin. He likes having two mums. He likes cheese sandwiches and his dog and drawing comics with his friend Pea. He does not like humus or heights. His twin sister Sammie likes being a twin too. She knows that she’s perfect best friend material for somebody: the girls in her class just haven’t realised yet. And she knows that she’s the best Sam: Sam A. 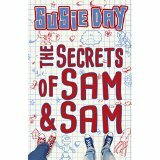 Both Sam and Sammie – and everybody in their lives seems to be keeping secrets – which ones will come out? 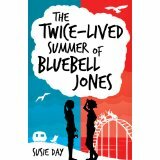 The Twice-Lived Summer of Bluebell Jones: On her thirteenth birthday, Blue makes a desperate wish. To be transformed into a cool, confident teenager. Enter Red, appearing from nowhere like a wacky fairy godmother. She’s only visible to Blue – in fact, she IS Blue, but a year older. With Red by her side to guide her, Blue can avoid all the gruesome embarrassments! But her future self causes a heap of crazy trouble – and there are dark secrets she’s not telling. My Invisible Boyfriend: Everybody loves Heidi’s boyfriend… Who wouldn’t love Ed? He’s perfect – a gorgeous, guitar-playing, motorbike-riding poet. There’s just one tiny problem – he doesn’t exist Heidi invented him in an emergency, to keep up with her friends’ sudden and all-consuming love lives. Everyone’s fallen for it – and for him. They are all messaging him with their deepest secrets and Heidi’s mad online life is about to collide with her real one.